The image above is from Elite Drone Services, taken October 2018. Funding for a lake-level gauge at Artist Lake has not yet been appropriated. The USGS will still continue to pursue avenues to secure funding for a gauge on Artist Lake, as well as some others in the region, but at this time there are no firm commitments. MICA has also asked for funding for an Artist Lake gauge, and TOB Councilman Michael Loguercio has promised to pursue this. 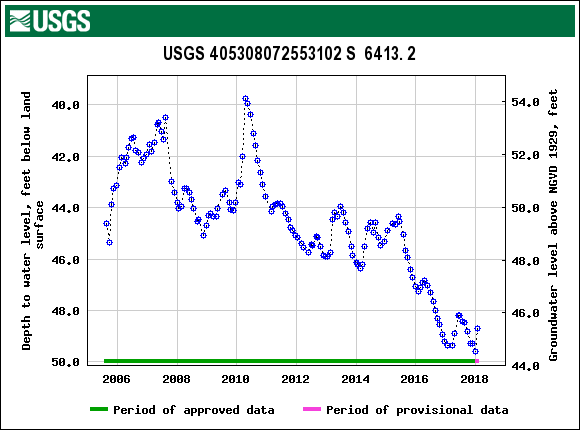 As part of the USGS cooperative program with the Central Pine Barrens Commission, they have installed a continuous record at nearby monitoring well S 6413, which can provide some better insight into water-level fluctuations at the near by lake. Below are some links to information about the Pine Barrens monitoring program and links for daily data and historical statistics for well S 6413. Artist Lake is slowly recovering from near-record drought conditions. 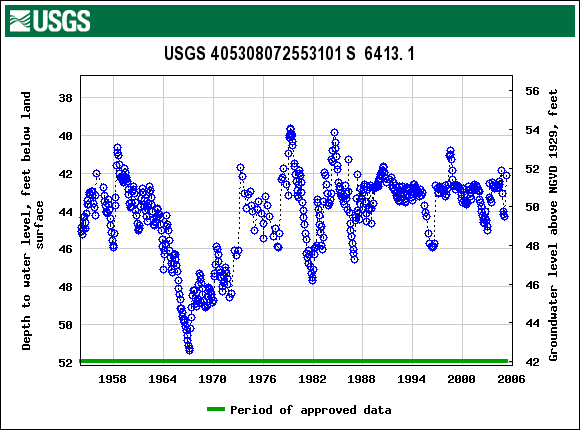 Similar low levels were recorded back in the mid 1960s and in the early 1980s. Long time residents also recall high water marks reaching across Middle Country Road to the northern side, where the 4th basin of the lake once sat before it was filled in for an amusement park. Very few people realize how shallow most of Artist Lake is — even at its fullest, much of its 30 acres is only about two feet deep, making the effects of any drought even more noticeable on this glacial kettle hole lake. 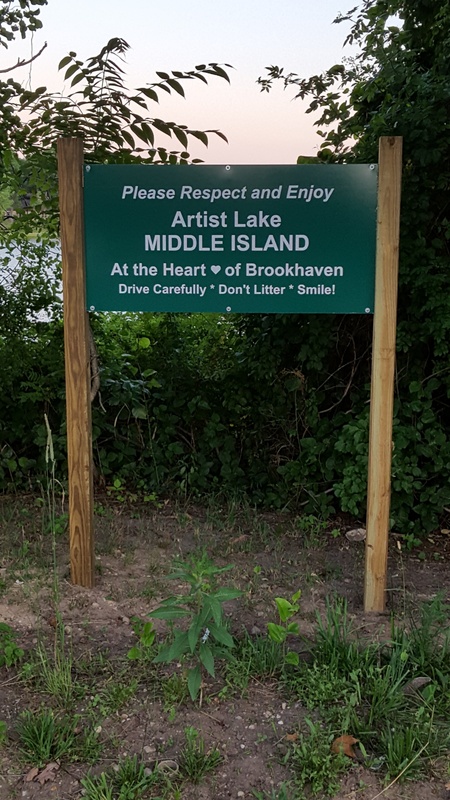 A Task Force was established in August 2018 to address various concerns at Artist Lake, including severely low water levels, invasive plants, large debris in the lake, litter, the need for beautification and enhanced user amenities. The Town of Brookhaven agreed to work with the group and will continue to host regular meetings. Initial efforts will focus on research, removal of large debris items, contacting the DOT about guard rail and overgrowth, increased signage for park goers and more. A HAB (Harmful Algae Bloom) was detected in Artist Lake in late August 2108; this new cyanobacteria bloom, more commonly known as blue–green algae, remained for several weeks during which members of the public and pets were advised not to enter into or come in contact with the water. Here is a link to a 1981 New York Times article lamenting similar low water levels. It’s interesting to note that long time residents then thought the “new” condominium projects might be responsible for the low water levels. Now the residents of these condos are the very ones looking to improve Artist Lake! Town of Brookhaven Chief Environmental Analyst Anthony Graves explains further: “The level of the lake is controlled by the level of the water table. I found that the water table has been dropping, it has dropped about 3 feet since 2012. This is the cause of the shallow conditions and the exposed shoreline. The decline in the water table is a longer term trend that would likely be reversed if we have a few years in a row with above average precipitation. “I would expect that the vegetation will die back in response to the lowered level of the lake, that will create some short term problems including odor and a lack of oxygen in the water as a result of decaying plant material using up the oxygen. When the water table rises the lake will expand and the plants will recolonize the areas that are now exposed. MICA receives regular updates about harmful algal blooms and notifies members and the Longwood Community about any findings. In 2016 and 2017, the only local bloom was at Spring Lake Golf Course, possibly caused by runoff from fertilizers used thereon. The 2018 Artist Lake HAB was the first recorded there in many years, and was followed by one in Spring lake a few weeks later. Here is more info from the NYS DEC website about Artist Lake, especially about fishing! Artist Lake is a glacial kettlehole lake located directly south of Middle Country Road (Route 25) in Middle Island. The fishing is good, but anglers looking to escape civilization will not appreciate the nearby traffic. Artist Lake holds a diverse warmwater fish community, including largemouth bass and pickerel. It is also one of Long Island’s better waters for crappie and perch. Access is via Town of Brookhaven park located directly off of Middle Country Road. Directions: Take Route 25 to Middle Island; lake is on the south side of the road opposite the old K-Mart lot. Restrictions: Hand launched boats are allowed; shoreline access is available but limited. Visit NYS Department of Health website (link leaves DEC’s website) for health advice on eating fish you catch. 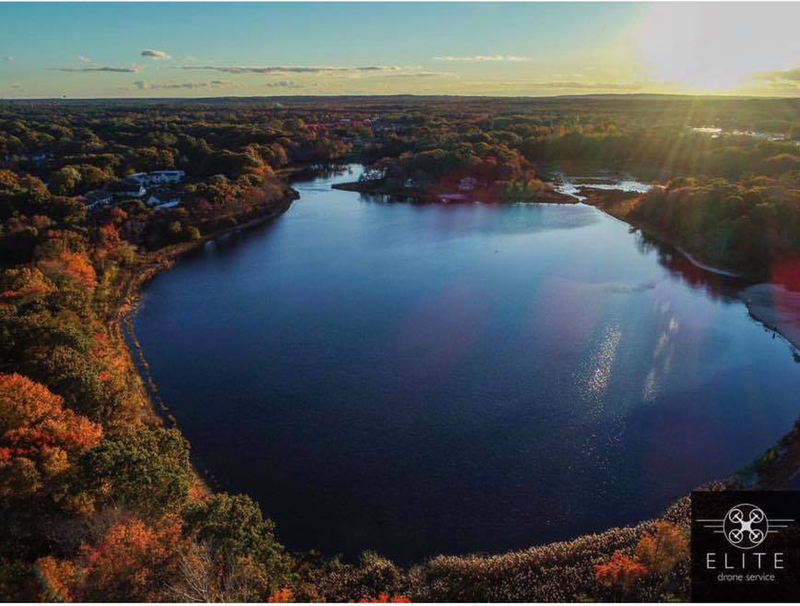 Scroll to the bottom of the page for Long Island freshwater waterbodies. Artist Lake is a gift of the last ice age. Its irregular shape was formed by the melting of massive chunks of partially buried glacial ice. A lake formed this way is called a kettlehole. Artist Lake has no inlet or outlet streams. Therefore, the water level is determined by groundwater that gradually changes during periods of dry or wet weather. Artist Lake is composed of three connected basins with a total surface area of 30 acres. The largest and deepest basin is the east basin which has a maximum depth of nine feet. The south and west basins are shallower, particularly the west basin which does not exceed two feet in depth. Nineteenth century maps show a fourth basin on the north side of Middle Country Road where the Kmart parking lot is presently located. This basin was filled in and paved over after World War II, an episode still remembered with disgust by many oldtimers. Such public outrage led to the enactment of today’s wetland protection laws. Two explanations exist for the origin of the name “Artist Lake.” The shape of the lake reminds some of a painter’s palette. Others identify Alonzo Chappel as the prominent artist for whom the lake was named. Chappel is listed as a resident in the U.S. Census of 1870. Artist Lake had formerly been known by several other names. In the 1830s, local residents, impressed by the abundance of water lilies, called it “Blooming Lake.” The lilies continue to adorn the lake today. In midsummer, when drought is not prevalent, the entire west basin is filled with fragrant white flowers. Artist Lake contains an assortment of warmwater fishes. Largemouth bass, chain pickerel, bluegill, pumpkinseed, black crappie, yellow perch, and brown bullhead are present. Artist Lake is one of Long Island’s best crappie lakes. However, strong year classes often disappear rapidly due to intense fishing pressure. To address this problem, a 9 inch minimum length regulation and a daily limit of 15 were imposed in the 1990s. Artist Lake consistently yields largemouth bass over four pounds. In order to maintain the size structure of the bass population, bass fishing on Artist Lake is catch and release only year round. Spring is an excellent time to try crappie fishing in Artist Lake. Try suspending small jigs tipped with waxworms beneath a bobber. Fish the shorelines and mouths of shallow coves early and shift to the deeper holes as summer approaches. The edges of weedbeds and gaps in the weeds are particularly productive. The submerged vegetation becomes quite dense in Artist Lake in the summer. However, this cover holds bass that may be reached using powerworms, sluggos, or other soft-plastic lures. Many such lures can be rigged to avoid getting stuck in the plants. Ask for tips at your local tackle shop. Most of the shoreline of Artist Lake is privately owned. However, public access is available from Middle Country Road (Route 25). Canoes or other hand carried boats can be launched from a small Brookhaven town park on the south side of the road. Fishing from shore is also possible. There is room for five or six cars to pull off the highway. Artist Lake is located on NYS Route 25 in Middle Island just east of Suffolk County Route 21.